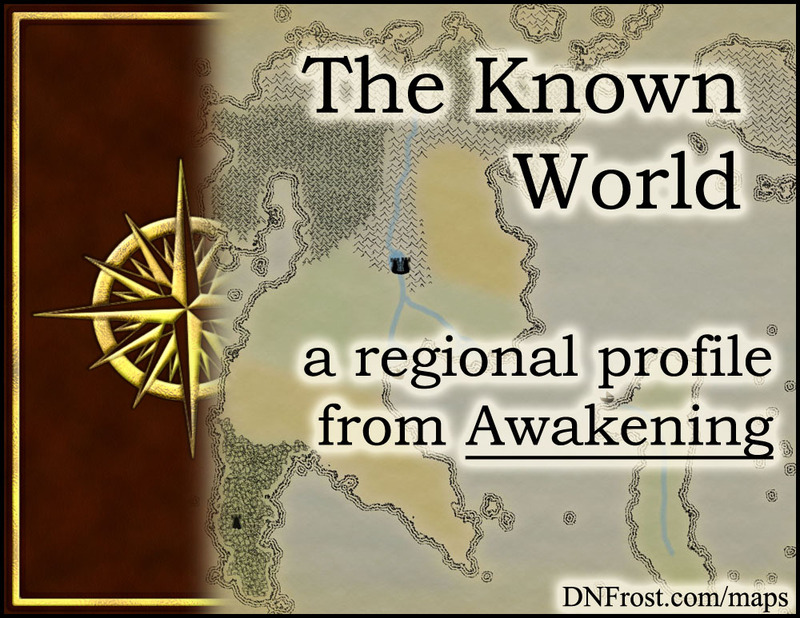 This post is Part 1 of a series to augment the Atlas of the Known World available for free download. An enchanted realm of magic and prophesy. You voted The Known World winner of September 2014 by 95%. 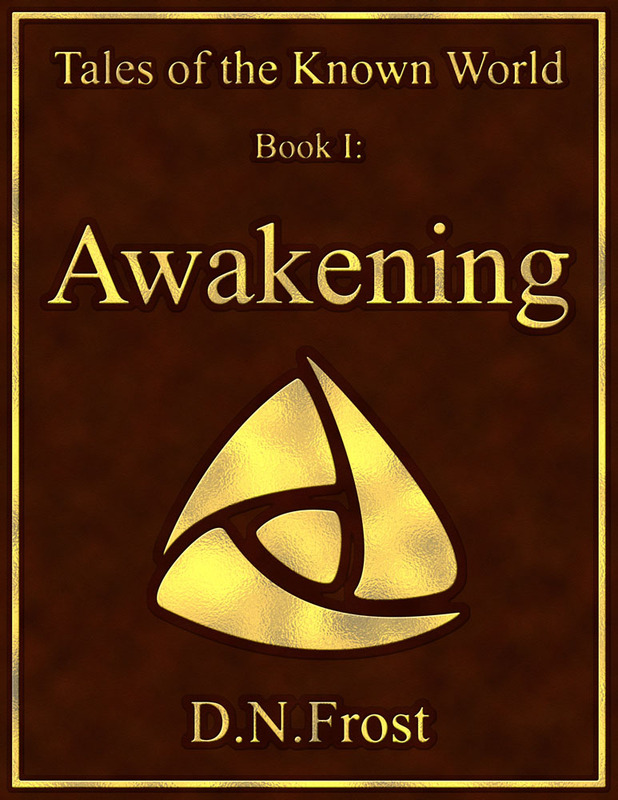 In Book One: Awakening, the sun rises on the Known World in the east, and prevailing winds circle from the west. Four seasons stretch the days of summer to cull the winter daylight. Much like Earth, twelve months of four weeks mark the clockwork of its orbit around a yellow sun. But two moons phase through the Known World's sky. The bright, silvery-blue First Moon swells full every 24 days. The smaller, rusty-orange Last Moon takes three times as long. When the phases sync every 36 days, they cast shadows at full, or forsake the sky for a truly moonless night. This region contains Kholl, the Plains of Rishi, and the badlands of Old Ryerin. The plants and animals of the Known World are familiar to us, though some we dub 'mythical creatures'. Dragons nest in the high mountains of the north, and their wingless cousins, the drakes, inhabit caverns and lower altitudes. Wyverns, the most common relative of dragons, are waist-high creatures with wings and back legs. Domesticated for food and hide, wyverns survive extreme climates and eat almost anything. Wild herds roam the open plains, feeding on insects, grass, and scavenged gryphon-kills. Sea wyverns travel along coral reefs, and pods have been known to herd fish into dead-end traps. The five races native to the Known World are men, elves, faeries, nymphs, and merfolk. Reclusive and prophetic, the merfolk keep histories dating back 10,000 years in coral libraries. Nymphs inhabit the dense Glades of Despair, and tend to be fairly short and pale, with rounded ears. Brightly-colored faeries rarely reach four feet tall, and dwell in the northern pine forests. The tallest of the landfolk, elves show great diversity across the D'jed Mountains and Plains of Rishi. Equally diverse, men have settled the Draconan Mountains and Sutek Desert of Allana, as well as Kanata, Kholl, and the Dohar archipelago. Styles of dress vary widely across cultures and subraces. Unlike foreign magics acquired through study, native magics arise in children and develop as they grow. Branches of these elemental, sensory, and special magics vary by race, and each branch provides individuals with both a prime and latent power. Generally, men display strong Flavor and Animal magic, but are weak Earth mages. Elves show slightly better Earth skills, but tend towards Metal or Sound magic. Though weak with Touch magic, nymphs make powerful Earth and Plant mages, with higher occurrences of rarefied skill. Faeries are great Air mages, with useful Scent and Intent magics to boot. The merfolk wield strong Water magic, but their aptitudes for Light magic and the prophetic Gift vary greatly between green and blue subraces. Magic saturates everyday life, so the people of the Known World have grown to view it as their birthright and heritage. Though not all are born with strong native abilities, anyone can learn to wield magic through enough schooling and practice. Families pass down magic techniques across generations, but only the wealthy classes produce well-rounded mages, because extensive education is an expensive privilege. With a few regional variations, the people of the Known World measure their age in years. Most calendars are derived from the solunar tables of the ancient merfolk, which place the winter solstice on 1:1:1:1 as New Year's Day, and the summer solstice on 3:1:1:1 at mid-year. All five races enjoy an 80-90 year life expectancy, but the age of adulthood differs across cultures. Class divisions are rather set, and children typically assume a role in the family enterprise. Few remain who carry out the traditions of the old warrior classes. Isolated bouts of plague and the increasing value of farmland drive the once-mighty gryphon riders to the background of the agrarian Rishi. The Dua Dara of the Sutek protect their desert from outsiders, and on the north slopes of the Draconan Mountains, bold youths still train to become dragon riders. Though respected, these warrior classes have lost relevance, due in part to the protection offered by the widespread reach of the Allanic Empire. With millennia of written tradition, the elusive merfolk speak their language of prophesy, but Allanic is a unifying tongue for most landfolk. Dialects vary by region, and Allanic has supplanted several heritage languages. Thone, the language of men, is spoken mostly on the fringes of Dohar, by sailors who switch back and forth to Allanic. Faeries preserve the Kalrei language in village ceremonies and rituals. Of all the old tongues, only Ka'e has seen a resurgence of speakers, the elf language revitalized as a symbol of elvish solidarity within the larger Allanic Empire. In the book Awakening, Kingard is a plains elf from the Rishi, immortalized by legendary deeds of centuries past. Kingard journeys to the mythic city A'lara, leading a misfit band of heroes to unbind the city's powers against an evil revitalized from Kingard's past. 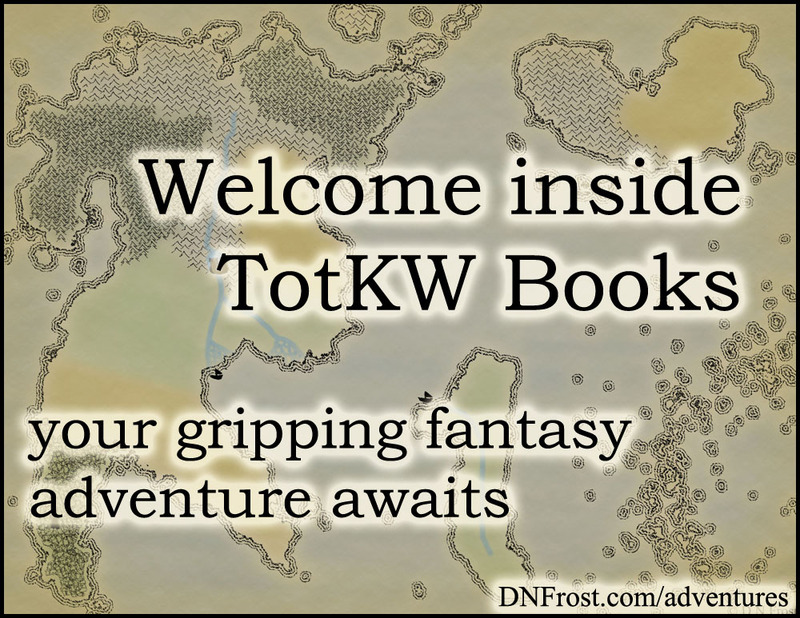 With him are the journeyman Tirrok of the Sutek, the faerie Vithril of Kalrein, young shape-shifter Darek of the Draconans, two gryphon riders, a pair of slaves from Kholl, and a spirited couple sailing from the eastern reaches of Dohar.